Jennifer Lien - Bio, Spouse, Parents, Children, Height, What Happened To Her? Home Actors & Actresses Jennifer Lien – Bio, Spouse, Parents, Children, Height, What Happened To Her? Jennifer Lien – Bio, Spouse, Parents, Children, Height, What Happened To Her? Jennifer Lien is an American former actress popular for her role as the alien Kes on the television series Star Trek: Voyager. Born as Jennifer Anne Lien on August 24, 1974, in Illinois, the actress is the last of her parent’s three children. She became interested in acting from the time she was little and joined the Illinois Theatre Center when she was 13. During a 1993 interview, Jennifer said she always used to pretend she was somebody else and would either write plays, watch movies or read books. She joined her school’s drama club when she was in seventh grade in junior high and while there, she discovered she could comfortably fit into acting. Based on the advice of an eighth-grade teacher, Jennifer said she went to acting class and eventually got an agent. Afterwards, she did industrial film and some theatre and it was not long before casting directors came calling and from there, her acting career took off. She made her first appearance on television in a bubble gum advert playing twins and later made her debut on a TV series as a music academy student in an episode of Brewster Place, a 1990 ABC show. The same year, she served as the voice behind the dubbed English language version of a French horror film titled Baby Blood. In 1991, the actress was cast as Hannah Moore on the series, Another World and as a result, she moved to New York where it was filmed. While working on the series, Jennifer enrolled in Professional Children’s School and also graduated. Other of her works includes Phenom (1993), Star Trek: Voyager (1994), The Critic (1994), American History X (1998), SLC Punk! (1998), Men in Black: The Animated Series (1997-2000), Rubbernecking (2001) and The Lion King 2: Simba’s Pride (1998). After the birth of her child on September 5, 2002, Jennifer Lien retired from her acting and voice-over career. In August 2010, she said she was taking health-related college courses with the intention of becoming either a dietician or nutritionist after completing her course. Surprisingly, everything appears to have gone south since then as the former actress has had run-ins with the law which led to her being charged with various offences. She was arrested for domestic assault in 2012 and in April 2015, she was again arrested and charged with evading arrest, resisting arrest, reckless endangerment and aggravated assault stemming from an incident in which she rammed a police cruiser with her vehicle. 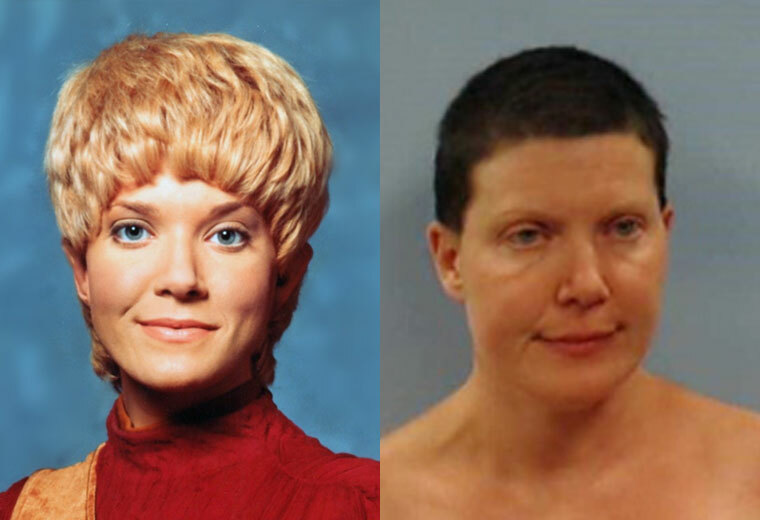 In September 2015, Jennifer Lien got into trouble with the law again and was arrested in her Roane County neighbourhood. This was because she allegedly exposed herself in the presence of some children on August 31, 2015. See Also: Kristy Mcnichol Brother, Net Worth, Partner, Is She Gay, Where Is She Now? According to her neighbour Carey Smith, Jennifer complained about her crying children and started saying vulgar things, ignoring Carey’s warning to mind her own business. During her tirade, the actress exposed her breasts and buttocks in the presence of two children who were in the yard while this happened. Carey called the attention of the police and when two officers arrived at her home with a warrant to arrest her on September 3, 2015, they met Lien naked under a blanket on her couch. The officers repeatedly asked her to get dressed but she refused, threatening to have them shot and killed. Eventually, Lien was handcuffed and dressed up in a shirt and pants from the jail with the help of a female police officer and was forcefully carried to the police car because she refused to walk to the patrol vehicle. She was transported to the Roane County Detention Center. In October 2015, Judge Dennis Humphrey ordered Jennifer Lien to undergo a mental evaluation at Moccasin Bend Mental Health Institute in Chattanooga to determine her competency. However, her two-count charge of exposing herself to children under the age of 13 was later dismissed in November 2016 after the actress paid restitution. Jennifer managed to stay away from trouble in 2017 but in March 2018, she walked into police net again. She was arrested for driving on a revoked license on March 2 and just two weeks after, she committed the same offence again and was arrested after a computer check was carried out and it revealed her license was revoked for a former DUI. The former actress is married to Phil Hwang, a writer and filmmaker known for the 2014 film Outcall, Superboy: The Tween Years (2015) and Geek Mythology (2008). Phil and Jennifer have been married for more than a decade and they have a son named Jonah, born on September 5, 2002. There is very little information about the actress’ family background. Although we do not know the name of her father and two siblings, we were able to find out her mother’s name and it is Delores Lien. The Star Trek: Voyager actress is 1.6 meter (5 feet 2 inches) tall. She has beautiful blonde hair and a blue pair of eyes. During her days as an actress, Jennifer was slim, had an oblong face, weighed 57 kg and a body measurement of 30C-23-33 (bust-waist and hips respectively) but this has changed since she retired. The formerly slim actress is now big and her current statistics is not known.